Very few researchers have considered peer-initiated online communities as sites where informal learning takes place. 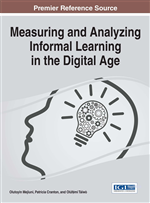 The goal in this chapter is to expand and enrich the conceptualization of informal learning by positioning it as a group meaning-making process rather than an individual cognitive product. The authors begin the chapter by providing an overview of the opportunities adults have to engage in informal learning through asynchronous conversations in online communities. Then, they summarize current conceptualizations of informal learning and the approaches researchers have used to examine it, noting both their potential and limitations. The authors synthesize the research they have conducted on online learning conversations over the last eight years and present their model of informal learning as a group meaning-making process. In this age of social media, mobile phones, and ubiquitous computing, informal learning theory has become especially relevant for understanding adult learning. Adults today engage in considerable learning outside of formal educational contexts, with much of this learning occurring online. Increasingly, adults spend time on the Internet engaged in activities such as finding social support, building relationships, exchanging ideas, and demonstrating expertise (Äkkinen, 2005; Porter, 2004). Although defining online communities remains a dynamic task, Wilson and Peterson’s (2002) definition incorporated the understanding that most scholars share: online communities are “interactions of dispersed groups of people with shared interests” (p. 449). This definition describes where the interaction takes place (online), who participates (dispersed groups), and why individuals participate (shared interests). In the early days of the Internet, there was a distinction between communities that were hosted by formal organizations or institutions and those that were started by a group of interested peers in a more grass-roots manner. Porter (2004) described these two types of communities as organization-sponsored and peer-initiated. Organization-sponsored, or designed, communities may be part of universities, continuing education programs, not-for-profit organizations, workplace training, or similar groups. Organization-sponsored communities have specified content and expressed goals (such as learning outcomes) that prescribe to some extent how community members will interact online. Guidelines for interaction among members of these groups are usually prescribed by an instructor, trainer, or set curriculum. In contrast, a peer-initiated, or spontaneous, community grows from the ground up as the members themselves determine the content of their conversations rather than relying on an officially designated facilitator or instructor. Communication exchanges can occur on a more level playing field, replacing the hierarchical structure of didactic talk of teacher to student or expert to novice. Participants enter and leave the online community on their own terms; they might participate actively by posting or by listening to/reading the conversation as “lurkers” without responding (Yun & Park, 2011). Surprisingly, very few researchers have considered these peer-initiated, spontaneous online communities as sites where informal learning takes place. In this chapter we explore the reasons for this, propose an expanded conceptualization of informal learning based on our model of group meaning-making, and propose a research approach as a start to understanding informal learning in these communities. Hence, our purpose in this chapter is to expand and enrich the conceptualization of informal learning. We begin the chapter by providing an overview of opportunities adults have to engage in informal learning through online conversations. Then, we summarize current conceptualizations of informal learning as individual, cognitive processes and the approaches researchers have used to examine these, noting both the potential and the limitations of this research. In contrast, we synthesize the research we have done on group meaning-making over the last eight years to show how the model evolved. We conclude the chapter by illustrating how the group meaning-making process (Paulus, Woodside & Ziegler, 2007; Woodside, Ziegler & Paulus, 2009; Ziegler, Paulus & Woodside, 2006a; Ziegler, Paulus & Woodside, 2006b; Ziegler, Paulus & Woodside, 2014) can be seen in the informal learning in online communities. The model illustrates the potential for expanding conceptualizations of informal learning to include group meaning-making through online conversations.